It’s not at all new for roller coasters and other adrenaline-inducing rides to be themed around comic book and cartoon characters. But the upcoming Warner Bros. theme park in Abu Dhabi is going to be on a whole other level, featuring some pretty deep cuts from DC Comics lore. Warner Bros. World is going to feature six differently themed areas, each drawing from a superhero or animation for inspiration. Metropolis, Gotham City, Cartoon Junction, Bedrock, and Dynamite Gulch will all have rides, food courts, and the like. The restaurant in the area named after Superman’s city will be the Ace o’ Clubs, based on the joint owned by lovable palooka Bibbo Bibbowski, who was a staple of the 1990s Supes comics. 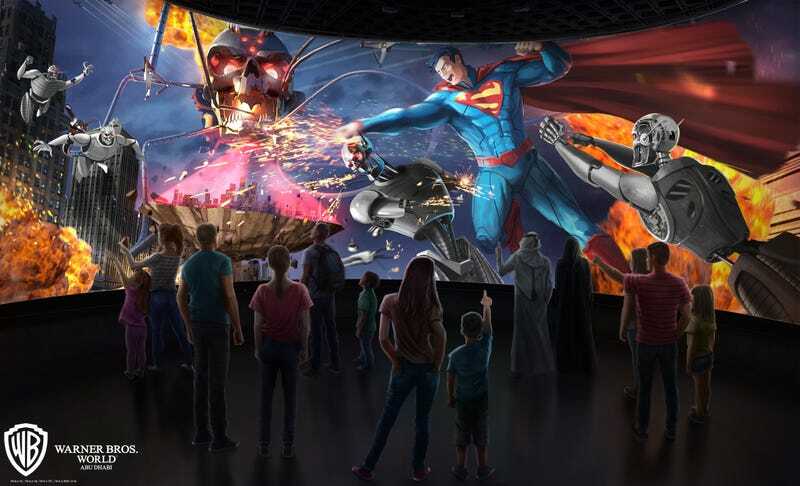 The iconic Daily Planet, Metropolis’ famed media conglomerate, is home to Superman 360: Battle for Metropolis, a pulse-pounding attraction that features the Man of Steel in a riveting battle of good versus evil that will decide the fate of Metropolis. Thrill enthusiasts entering the legendary Hall of Justice, the massive headquarters of the Justice League, can hop onboard Justice League: Warworld Attacks, a thrilling dark ride that utilizes immersive media and special effects to take guests on an unforgettable ride as they team up with the Justice League to fight off invaders from another galaxy. Other exciting attractions that Metropolis will include are Green Lantern: Galactic Odyssey, an awe- inspiring 4D “flying theatre” that transports guests across the cosmos to extraordinary worlds enriched by multi-sensory special effects, and Teen Titans Training Academy, a multi-level play area featuring a zipline and other physical activities that invite aspiring heroes to showcase their skills alongside the legendary Teen Titans. This Green Lantern looks a little like Nathan Fillion, no? There’s no opening date yet, but Warner Bros. World sounds like it’s trying to give the Disney theme parks a run for their money when it opens later this year.